Producing pure sweet sorghum syrup since 1926. 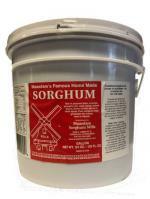 Sorghum is a syrup made from sweet sorghum cane used as a table syrup and can be used in baking. Example: Use sorghum syrup on pancakes, corn bread, and bread. Use sorghum syrup in baked beans, cookies, BBQ sauce and popcorn balls. One gallon of pure sorghum syrup made from the juice of the sweet sorghum cane. One half gallon of pure sorghum syrup made from the juice of the sweet sorghum cane. One pint of pure sorghum syrup made from the juice of the sweet sorghum cane. Click here to learn how to substitute sorghum for other sweeteners.